Spring has come early in the Six Nations. The opening two rounds have been relatively open, assisted by a sharp drop in the penalty count as referees look for fewer excuses to blow the whistle. With the emphasis this year on continuity rather than a contest for possession teams, led by England, are becoming less reliant on set-pieces and turnovers as vehicles for tries. From 2006 until last year the average number of penalties in a Six Nations match was 21.4, ranging from 18 in 2008 to 24 in 2013 when reset scrums were a bane and some teams used the set-piece to try and wangle a penalty to kick the ball downfield and enjoy an attacking lineout, not least Wales when they secured the title against England on the final day. The average this year is 13.8, a 35% drop. The six matches have produced 33 tries and 19 penalties and, if that is similar to last year, 32-22, when Italy’s matches are excluded 26-14 plays 16-20. Penalties outnumbered tries every year from 2012 with the exception of 2017 when it was 28-28, but again when the Azzurri were factored out, penalties triumphed – by 29-9 in 2015, the year the Six Nations was unrepresented in the last four of the World Cup. The five matches involving France last year produced 14 tries, two of them penalty tries. Their two this month have yielded 12, including a penalty try. If Les Bleus were all too easily outwitted by England at Twickenham last Sunday, geared up for a long-distance race only to find themselves in a sprint, they had a go against Wales before becoming overcome by the moment. Sides in possession have a greater licence this year. The percentage retention rates are well into the 90s for scrums, lineouts and breakdowns and there is a clear emphasis on speeding up the game. Crooked feeds and throws are connived out and all manner of clear-outs are tolerated. When the Japan coaches spent a week this month watching England train, they said their aim was to achieve a ball-in-play time of 50 minutes in the World Cup. It looks attainable and it is hard to dodge the suspicion that part of the drive to increase the flow of matches has the hosts in mind, given their historic weakness in set-pieces. England have embraced the shift in emphasis. A team that was hard to work out last year because it seemed to lack definition, in part because of an injury list that appeared to get longer, is suddenly in sharp focus. Eddie Jones had always maintained the importance of an English approach, based on the set-pieces, mauling and kicking, but he has spiked it with pace. They are playing as they train. When England last year ended a run of five successive defeats by winning the final Test against South Africa, George Ford had been replaced by Danny Cipriani at outside-half. When Cipriani’s chip for Jonny May clinched the match, it looked as if he would remain in the squad. Instead, despite Ford starting only the match against Japan since, Cipriani has returned to the wilderness. Owen Farrell has taken over at 10 and been given the captaincy. He was one of three survivors last Sunday from Jones’s first starting line-up against Scotland in 2016 – George Kruis and Billy Vunipola were the others. Jones has gradually decommissioned his old guard but Farrell’s influence has been heightened by his moving from centre. 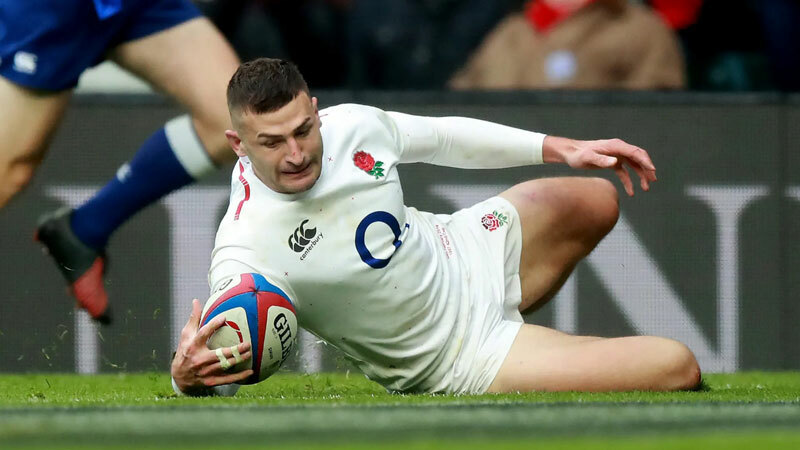 If he has been blessed with more ball-carriers than England had a year ago when the likes of Manu Tuilagi and Billy Vunipola were absent, he has a decisiveness England were lacking. Jones said the two victories were down to the players rather than the coaches but that was only in the way plays were executed. They were both coaching triumphs and in hindsight the clue to the approach against France could be seen on the bench which for the last three years has contained finishers rather than replacements. By bringing in the props Ben Moon and Dan Cole and swapping Jack Nowell and Chris Ashton so that the latter was in the starting line-up, Jones was placing emphasis on the start rather than the finish, expecting to be protecting a lead rather than looking to break clear. The assumption was that England would indulge France in an arm-wrestle for an hour before exploiting their perceived relative lack of fitness but they suckered them into guarding the gainline, committing players to rucks and defending high and narrow. They were left kicking themselves as England sought space rather than contact. As in Dublin, it was a masterly execution of the game plan that put England on the front foot from the off and delivered a bonus point as well as victory. It means their next match, against Wales in Cardiff, is a title decider, but only for Jones’s team. If England win, five points from their next match at home to Italy may land their third championship in four years with a round to spare.